The 55-year-old was found by housekeepers following an apparent suicide. Spade is pictured with handbags and shoes from one of her collections in 2004. 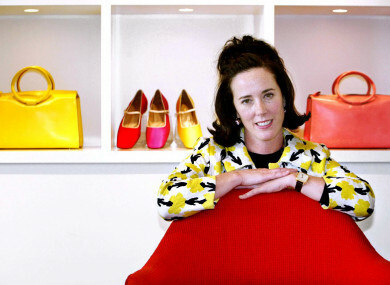 NEW YORK FASHION designer Kate Spade has been found dead in her apartment in an apparent suicide. Law enforcement officials say she was found by housekeeping staff inside her Park Avenue apartment at about 10:20 am local-time today. They say she left a note at the scene. The officials were not authorised to divulge details of an ongoing investigation and spoke on condition of anonymity. The 55-year-old Spade created a line of sleek handbags in the early 1990s that that were incredibly successful. Her company, Kate Spade New York, has over 140 retail shops and outlet stores across the US and more than 175 shops internationally. A company representative did not immediately respond to phone and e-mail requests. She walked away from the company in 2007, a year after it was acquired from the Neiman Marcus Group for $125 million by the company then known as Liz Claiborne Inc. In 2017, Coach bought the brand for $2.4 billion. Spade and her husband Andy started a new handbag company a few years ago, Frances Valentine. She changed her name to Katherine Noel Frances Valentine Brosnahan Spade, she said in an NPR interview this year. In addition to her husband, Spade is survived by a daughter, born in 2005. Email “Fashion designer Kate Spade found dead in New York apartment”. Feedback on “Fashion designer Kate Spade found dead in New York apartment”.